1stFlip FlipBook Creator Pro for Mac v2.8.8 Released! 1stFlip FlipBook Creator Pro for Mac v2.8.3 Released! 1stFlip FlipBook Creator Pro for Mac v2.8.1 Released! 1stFlip FlipBook Creator Pro for Mac v2.7.22 Released! Fixed the created flipbook app error. 1stFlip FlipBook Creator Pro for Mac v2.7.21 Released! Redirect to HTML5 version automatically when flash player is disabled. 1stFlip FlipBook Creator Pro for Mac v2.7.20 Released! 1stFlip FlipBook Creator Pro for Mac v2.7.19 Released! 1stFlip FlipBook Creator Pro for Mac v2.7.18 Released! 1stFlip FlipBook Creator Pro for Mac v2.7.16 Released! 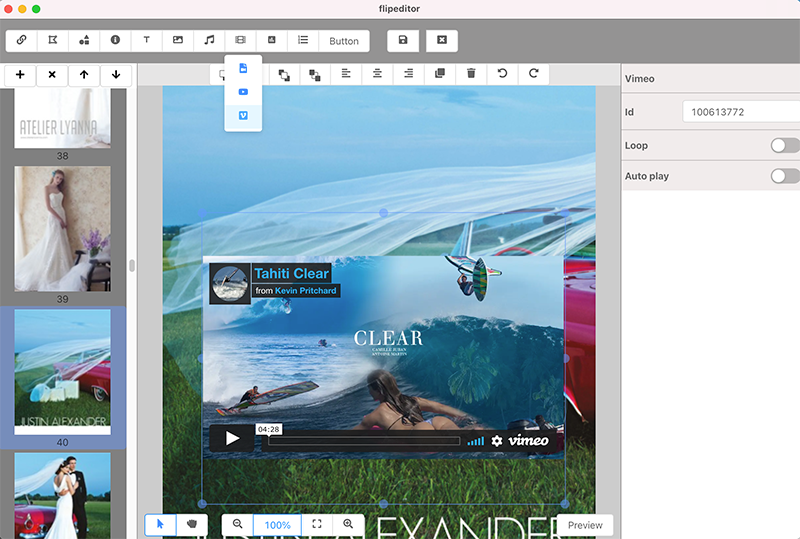 1stFlip FlipBook Creator Pro for Mac v2.7.14 Released! Add new page turning style: Slide - Double pages. 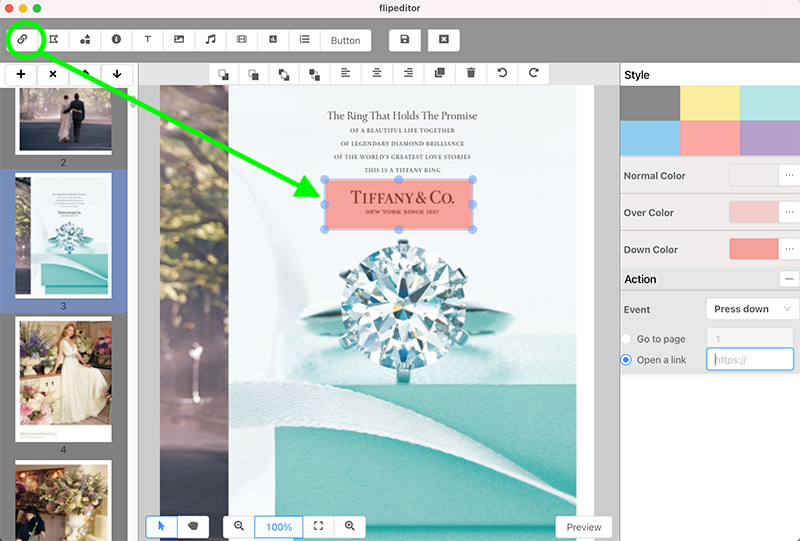 1stFlip FlipBook Creator Pro for Mac v2.7.13 Released! 1stFlip FlipBook Creator Pro for Mac v2.7.12 Released! Optimized zoom feature on mobile devices. Optimized flipbook share, search feature. 1stFlip FlipBook Creator Pro for Mac v2.7.10 Released! Create Search Engine Optimized HTML flipbook. 1stFlip FlipBook Creator Pro for Mac v2.7.9 Released! Optimized page-flipping experience on mobile devices. Support page-flipping in zoom mode. Optimized video and audio embedding. Fixed Vimeo player size bug. 1stFlip FlipBook Creator Pro for Mac v2.7.6 Released! Fixed HTML5 flipbook search error. 1stFlip FlipBook Creator Pro for Mac v2.7.5 Released! 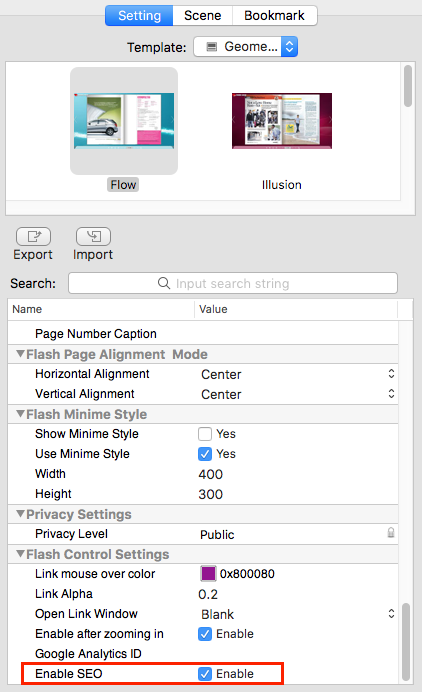 Customize page width or height to add margin to flipbook. Embed button, link, image, text, music, video, etc. to flipbook margins. 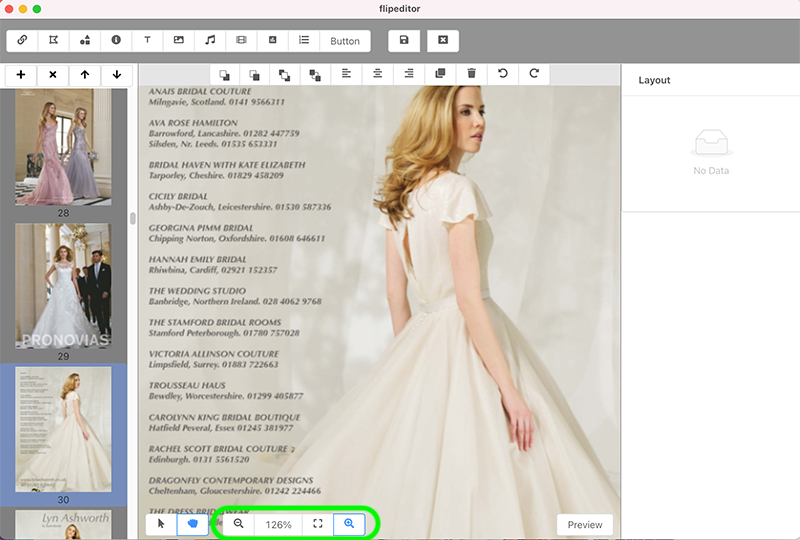 Add Zoom in/out button to Page Editor. Show Flip button when viewing HTML5 flipbooks on computers. 1stFlip FlipBook Creator Pro for Mac v2.7.3 Released! Support adding link area to flipbook pages. 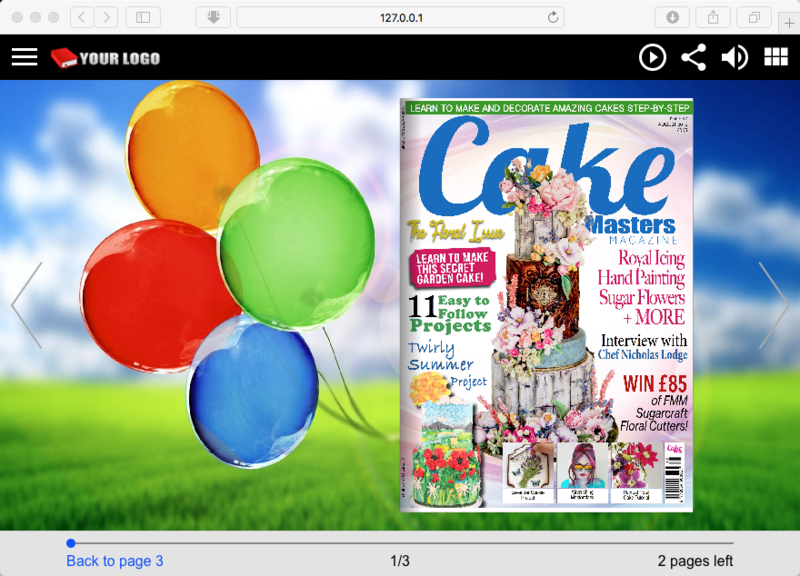 Offline HTML5 flipbooks can be previewed on Mac with Safari. 1stFlip FlipBook Creator Pro for Mac v2.7.2 Released! Support adding Vimeo video to any flipbook pages. Fixed video position issues in HTML5 flipbook. 1stFlip FlipBook Creator Pro for Mac v2.7.1 Released! Optimized flipbook on Android devices. Fixed hyperlinks issue of inserted buttons. Fixed a flipping sound bug. Fixed a flipbook multilingual toolbar bug. 1stFlip FlipBook Creator Pro for Mac v2.6.2 Released! Fixed the bug that embeded video doesn't appear in output exe flipbook. 1stFlip FlipBook Creator Pro for Mac v2.6.1 Released! Add mobile flipbook responsive design. 1stFlip FlipBook Creator Pro for Mac v2.5.12 Released! Fixed flipbook Facebook sharing error. 1stFlip FlipBook Creator Pro for Mac v2.5.11 Released! 1stFlip FlipBook Creator Pro for Mac v2.5.10 Released! Fixed the slow loading when inserting new page to flipbook project with many pages. 1stFlip FlipBook Creator Pro for Mac v2.5.9 Released! Fixed the error when inserting new page to previous flipbook project. 1stFlip FlipBook Creator Pro for Mac v2.5.7 Released! Fixed the error that sometimes program failed to update the information from server. 1stFlip FlipBook Creator Pro for Mac v2.5.6 Released! Fixed the bug that background music does not repeat when sound loop is set to -1. 1stFlip FlipBook Creator Pro for Mac v2.5.5 Released! Embed GIF to flipbook pages. 1stFlip FlipBook Creator Pro for Mac v2.5.3 Released! 1stFlip FlipBook Creator Pro for Mac v2.4.1 Released! Add flipbook minime mode (hide toolbar and buttons). Flipbook privacy settings: add password to all pages or partial pages. Enable/disable any toolbar button: Social Share, Search, Bookmark, Select Text, FullScreen, Thumbnails, logo, sound, language, zoom and flip button. Support for opening certain page instead of first page when the flipbook is loaded. 1stFlip FlipBook Creator Pro for Mac v2.3.3 Released! Fix the bug that failed to search after saving flipbook project. 1stFlip FlipBook Creator Pro for Mac v2.3.1 Released! Convert multiple PDF files to flipbook simultaneously in batch mode. 1stFlip FlipBook Creator Pro for Mac v2.2.1 Released! All-new design for mobile version flipbooks. 1stFlip FlipBook Creator Pro for Mac v2.1.3 Released! Add chart alpha and font size option. 1stFlip FlipBook Creator Pro for Mac v2.1.1 Released! Support embedding charts to any flipping page. 1stFlip FlipBook Creator Pro for Mac v1.10.2 Released! Support converting images to flipbooks. 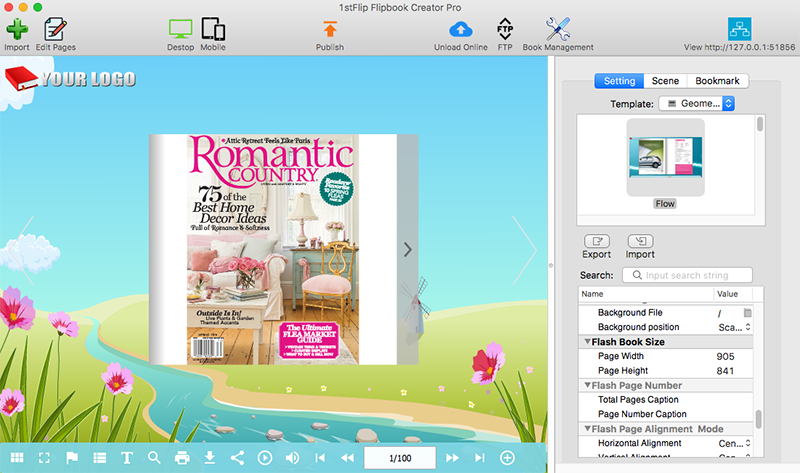 1stFlip FlipBook Creator Pro for Mac v1.09.1 Released! Fix the bug that exe flipbook can't be viewed on computers without flash player. 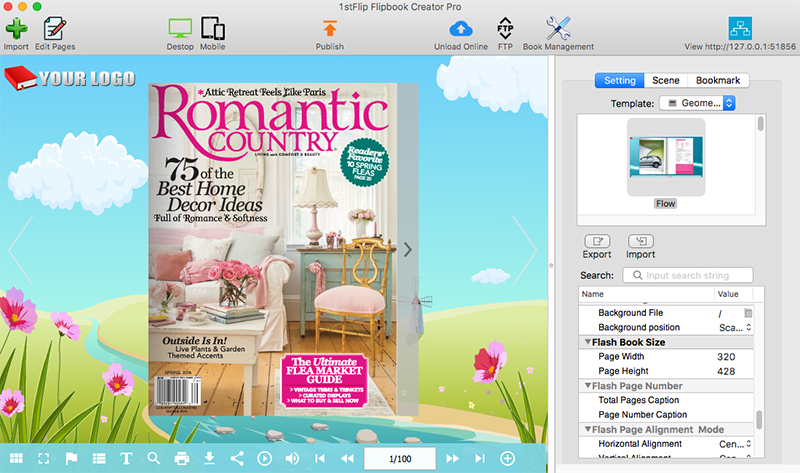 1stFlip FlipBook Creator Pro for Mac v1.08.2 Released! Fix the pink background bug when opening .app flipbook. 1stFlip FlipBook Creator Pro for Mac v1.08.1 Released! Support embedding gif file to any flipping page. Save, open, open recent project. 1stFlip FlipBook Creator Pro for Mac v1.07.6 Released! Add flip page alignment mode. 1stFlip FlipBook Creator Pro for Mac v1.07.5 Released! Support inserting line, shape, callout, text, image, music, video, YouTube video, button and number icon to customize flipping book pages. Built-in FTP client to one-click upload flipbook to your website or blog. Convert PDF to local page-flipping book in .html, .zip, .app, .exe format. LAN Preview - allows any device on your Local Area Network to preview flipbook. 1stFlip FlipBook Creator Pro for Mac v1.05.1 Released! Support adding link, shape, text, button, image, sound, video, SWF, YouTube video, printable area to flip page.